This is the El Salvador Finca El Manzano brought to you by Dillanos Coffee Roasters. Dillanos has been friends and buyers from Emilio Lopez Diaz and Finca Manzano for over 10 years. Emilio is an industry leader, innovating with processing techniques and quality farming practices. The results of his hard work is evident in this outstanding coffee. 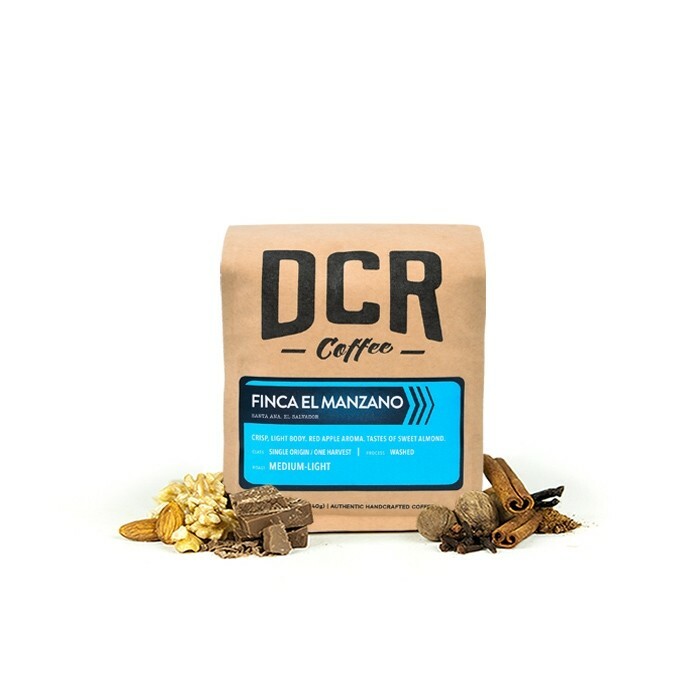 This cup is fantastically balanced, with notes of roasted nuts and chocolate and a full aroma. A good, solid, rich cup of coffee. Well balanced and most enjoyable. Love it - absolutely addictive smell, and a strong, roasty taste! Thanks! Excellent medium roast. Slightly fruity at first, with a nice chocolate and nutty finish. I expect to go back to this roast again. Flavors were good but a little weak. Liked the Mela Honduras better. Good coffee! I prefer a little more flavor than this coffee had, and a darker roast, but I still enjoyed it very much! Great flavor with an excellent balance. Enjoyable liked. Also liked how on bag it told you how much coffee is needed for the water for different types of devices used to make your coffee. French press uses less coffee per water vs drip. . This batch tastes very burnt. The beans themselves smell burnt in the bag. I have tried brewing as French press, drip, & pour over but so far the only way to mitigate the burnt flavor is lots of cream and sugar. At that point it is indistinguishable from gas station coffee. I thought this coffee was not very bitter, which I like. I prefer a little more of a roasty flavor in the profile and a bit more body. The bean color was pretty much on par with what I like, as it didn't look too light, but I could go a little darker. It was definitely very balanced to me though, which stood out. I'd like to find more coffees that have that balanced taste, that aren't too bitter or acidic. Great choice though! This bean doesn't taste fresh at all. It does not have the roasting date on it and tastes stale and bitter. The color and aroma is more like a medium roast then light roast than it's described. Really liked the balance in this coffee. No bitterness at all yet robust. Love this roast. Nutty with a sweet hint. When I first opened the bag, the aroma was amazing. Even my husband who does not like coffee said it smelled good :) I used the French press method with this coffee. I really liked it...smooth with nice chocolate notes. It's a light roast but is very smooth. There's a sourness to it but it isn't overwhelming. I had to use more beans than usual to make as strong of a cup as I like, and it wasn't the most satisfying cup, but it was good and I enjoyed drinking it. EDIT: So I discovered pourover coffee, and have been using that instead of my clever dripper. It made a HUGE difference. It no longer has the sourness, and I can taste the chocolate. There's a smokiness to this that I really like, too. A very good cup of coffee. Not as full bodied as I'd like. Subtle flavor profile. This coffee seemed acidic to me. I think I would like it better in a cold brew. I think we liked the last one better. Good flavor. Lighter roast than what I normal buy but very tasty. Poor, if it was really intended to be a medium roast.